My favorite thing about Thanksgiving is the opportunity to race on a Thursday morning. It's the only time I ever race on a non-weekend day and it feels good to run before I indulge in Thanksgiving food and drink. 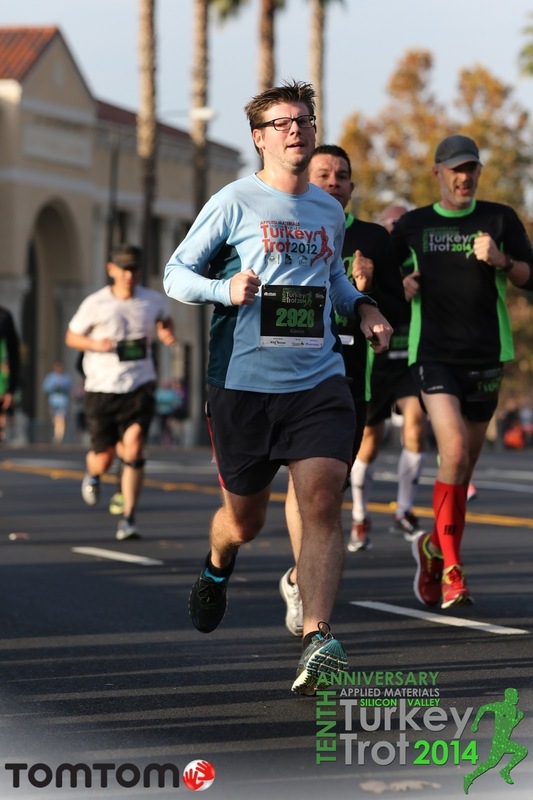 This year was my fourth Silicon Valley Turkey Trot 10K which is hard to believe; that means we've been in California for four Thanksgivings! By this point, I'm very familiar with this race course and the crowds that go with it. Luckily, we live within walking distance of the start so we don't have to deal with parking. This year there were almost 21,000 people who ran either the 5K or 10K. Isn't that crazy? Kevin and I left the house around 7:10 am for the 7:50 am start and made it in time to cheer for the elite men's start. I attempted to get into the 8-9 minute pace corral but failed in the crowd, and I ended up starting one corral earlier. I am not a 6-7 minute miler, clearly, but even that corral started around a 9:30 minute/mile pace so I wasn't blocking anyone. That said, I feel bad for the people who really do run that fast because they would not have gotten through. If you ever run this one and you are fast, get as far to the front as you can. 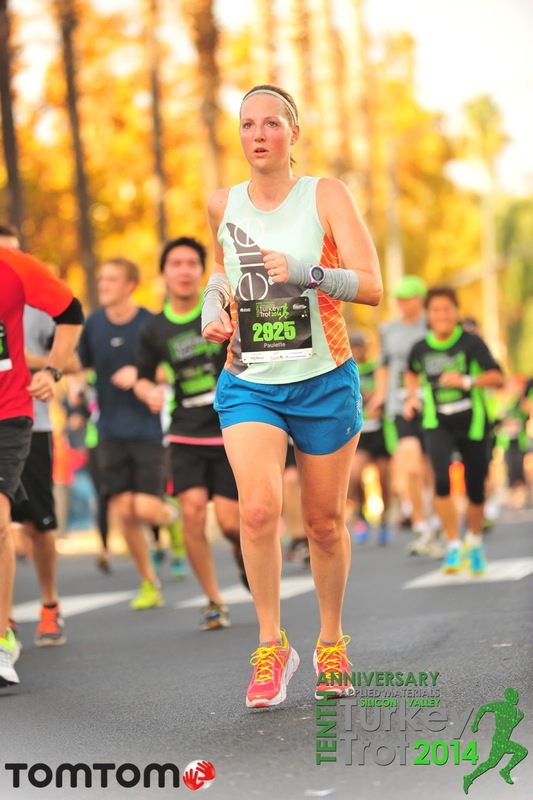 For once, I treated the Turkey Trot like a race and tried to push myself. 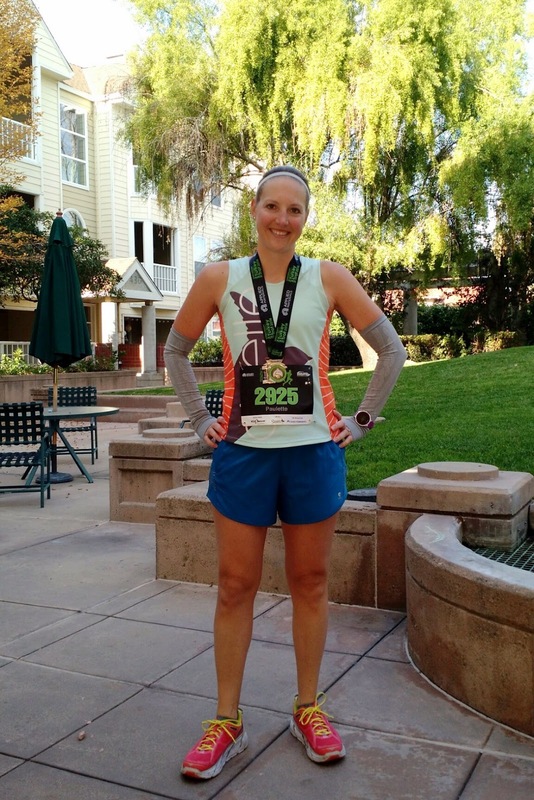 I had a mental struggle early on, as I always seem to when racing in San Jose, but I was able to keep going. I can't explain it, but racing in San Jose always seems hard to me. Maybe because I run similar routes here so often? By the time we hit mile 4 on the Alameda I was really feeling it and let myself be entertained by everyone around me. I focused on moving forward, not letting myself give up, and passing people one by one. Knowing the course and the turns was really helpful at this point because I could move toward the next turn when needed. (This course has many turns!) I wasn't moving fast enough for a PR pace, but I was happy with the effort considering I had felt slow during marathon training. We came upon the finish line fast and it wasn't visible, so I didn't really get a chance for the extra kick at the end. I was happy with the effort for the day and the finish of 57:05. That's a course PR for me, and considering I always struggle on this course, I'll take it! Oh, and they gave us free photos sponsored by TomTom. Pretty awesome! Kevin sporting vintage Turkey Trot apparel. After the finish line they directed us down the street and then into the nearby park for goodies. They have significantly improved this over the years - the first year I couldn't even get to the finish line because it was too crowded and had to slowly walk the last 0.1 miles of the race. No problems like that in the past couple of years though. 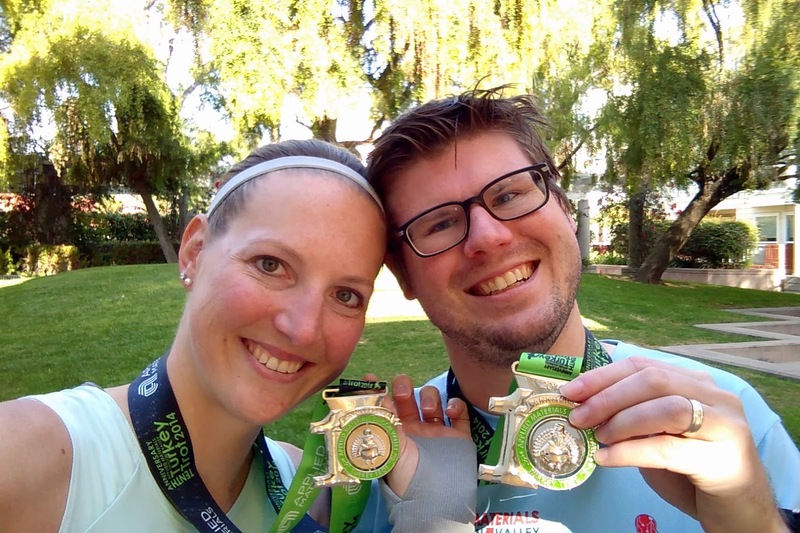 The first thing we received in the park was a medal because it was the 10 year anniversary of the Silicon Valley Turkey Trot. Pretty cool! They had tents with food and drinks in the park too. We hung out for a bit, said hello to many friends who were also running, and then walked the Guadalupe River Trail back toward our place. The rest of the day was spent resting, cooking, and hanging out with friends. 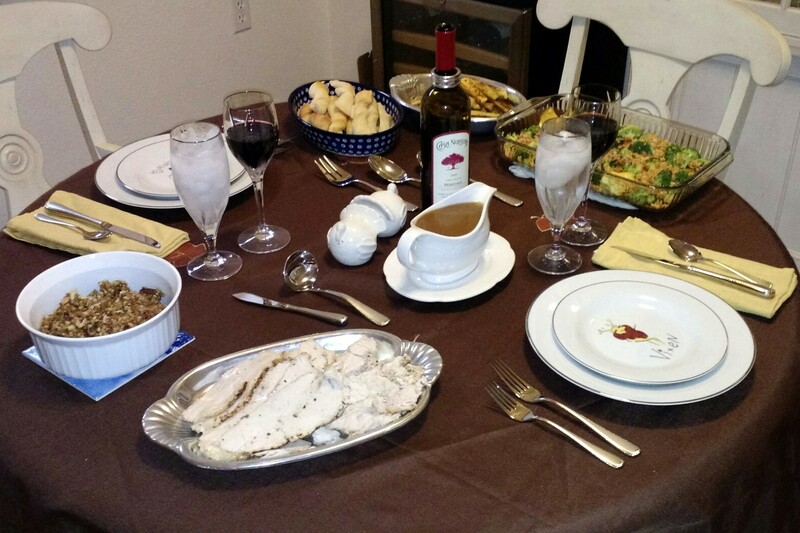 I cooked Thanksgiving for two at our house for Kevin and I, which was really fun. I especially enjoyed making (ok, eating) my favorite broccoli casserole, a recipe from Kevin's mom. We opened a favorite wine from Casa Nuestra and had fun spending time together. After dinner, we went to have dessert with friends. We took cheesecake, they had ice cream and pecan pie - yum. We watched Sleeping Beauty with the kids, and then we headed home because Kevin had to work on Friday. While he went to work, I went biking with a friend in Woodside. Friday was a fantastic, sunny day; it turned out to be the last day before the rain set in so I'm glad we took advantage of it. 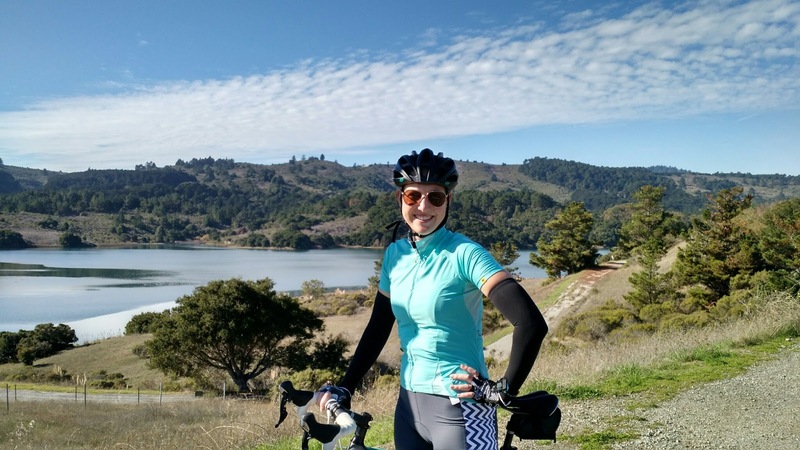 One of many awesome biking views in the Bay Area. The rest of the weekend was fairly uneventful but did include putting up the Christmas tree. How is it almost Christmas already? It's crazy how fast time goes. 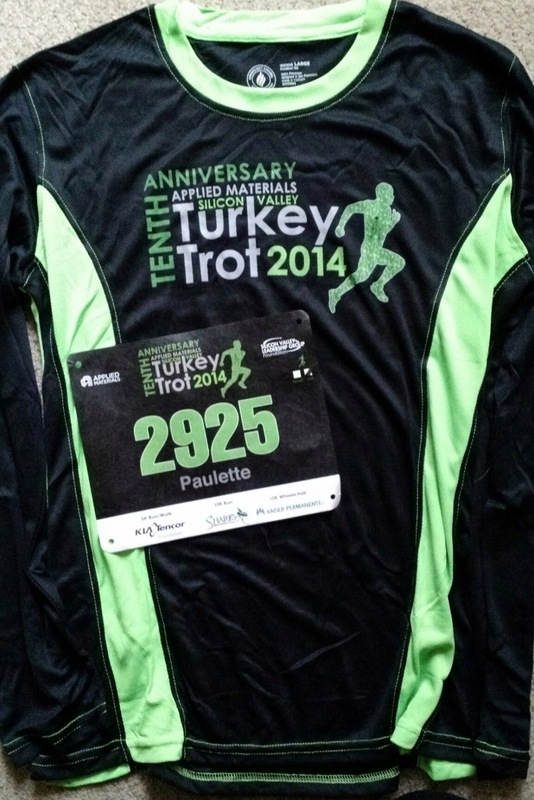 Since I had started running, I have been wanting to run The Turkey Trot in SJ, but it just never works out. My sister has run it a number of times and seems to enjoy it. Yay to free photos and pretty sweet looking tech shirts! Congrats on the course PR. I hear you one running in SJ. It seems so hard to run a race in my hometown since I feel like I know it so much already. And looking great with that bike! How many miles did you get done?